KALI CIESEMIER: The Power of Mom! 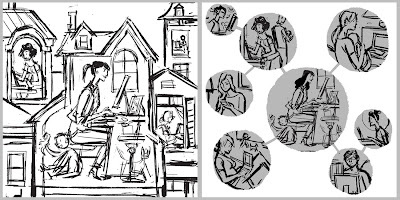 Right on the heels of my last piece are two more illustrations for this past weekend's Boston Globe magazine! This time I was honored to be illustrating the cover again, as well as an accompanying page inside. The theme of both illustrations was the power that moms wield through online networking (the cover is focused on the power, and the inside illo is focused on the connectivity). 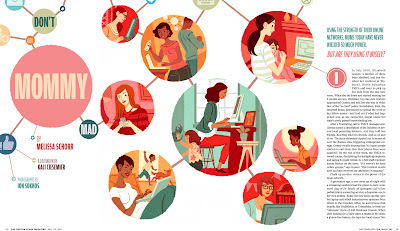 It's easier than ever for moms to connect and share tips, info, advice, and warnings on a variety of sites, blogs, and forums that are catered to them. 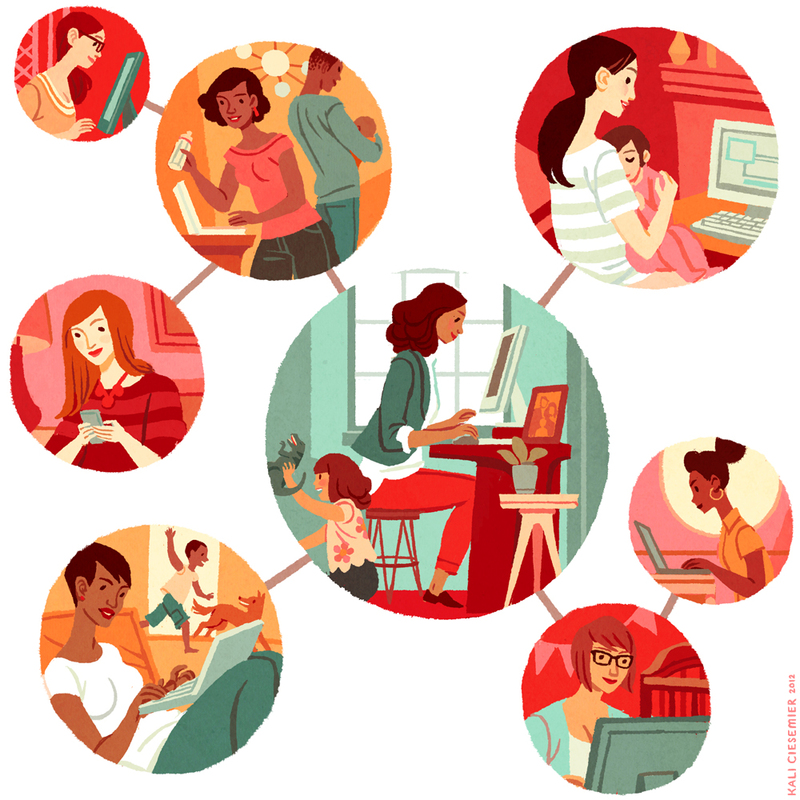 From the article, "While a mom’s opinions once only stretched so far — to her local play group or over the backyard fence — now they are amplified and shot around the world with a keystroke. 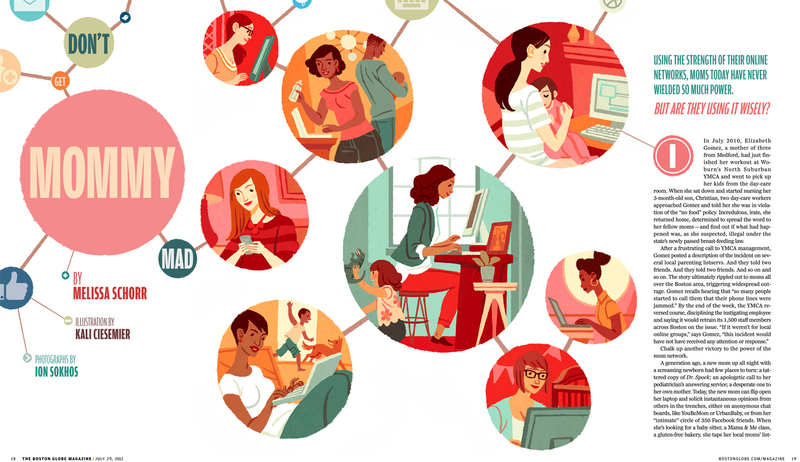 And if you make a mom mad, the power of her network is a force to be reckoned with." You can read the rest of the article here! The cover I made is a deliberate riff on Eugene Delacroix's Liberty Leading the People. I remembered the painting from my college art history class partly because it was the first time I learned about triangular compositions! 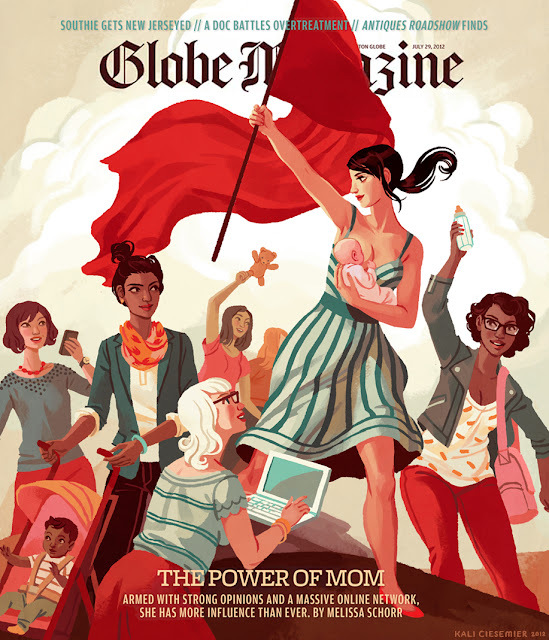 The revolutionary spirit also seemed to fit the article, though the editorial staff didn't want any moms with mean faces, so my ladies are a little more lighthearted instead of murderous. 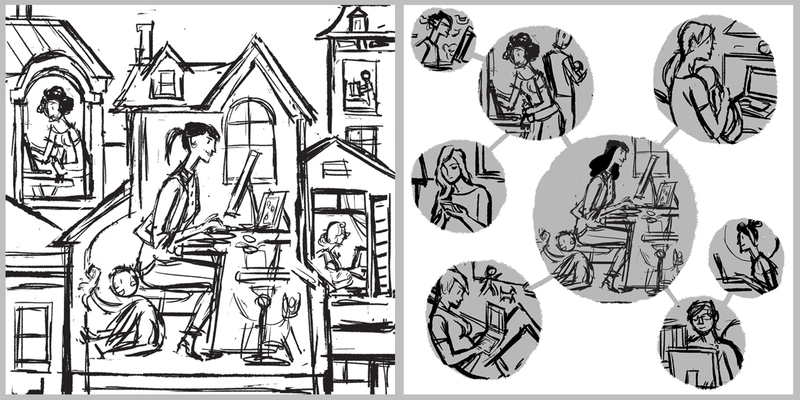 There was limited time for both illustrations so the inside illo is more simplified out of necessity, but because the colors for both are all in the same families I think they fit together, and I enjoyed working in both styles. Thanks again to my great AD Ryan Huddle for the assignment, and the fun layout he created inside! Kali, I loved the article, and your imagery really helped bring the message home. Please contact me if you are interested in developing any illustrations for children's books. I am CIO for gryphon design collective in Boston. I just found your blog through drawn.ca, and I'm so glad I did! Your work is lovely, the colours are wonderful and you have such a great way with composition. Plus you draw beautiful ladies. Double plus, you like Sabriel and Game of Thrones! I shall enjoy seeing more of your work. I looked around a little through your blog, everything is so wonderful! I like how you have a range of style. Are you doing this work digitally? NSE, BSE,MCX and NCDEX completely. Hi Kali, your work is amazing, congratulations! I would love to buy the poster of this illustration but I don't see it available in your e-shop, any ideas how I can do this? Thanks in advance! Graphic designs Dubai giving more good looking to the web page for attracting the people. Attractive designs and colors of websites only should keep the visitors for long term. Thanks for sharing a very interesting article about The Power of Mom! This is very useful information for online blog review readers. Keep it up such a nice posting like this.